Onwards to Pinnenberg Germany where Miss Minetti became second in Pinnenberger Kleinkunst festival in June, Frauenpower was the word of the day in Pinnenberg. 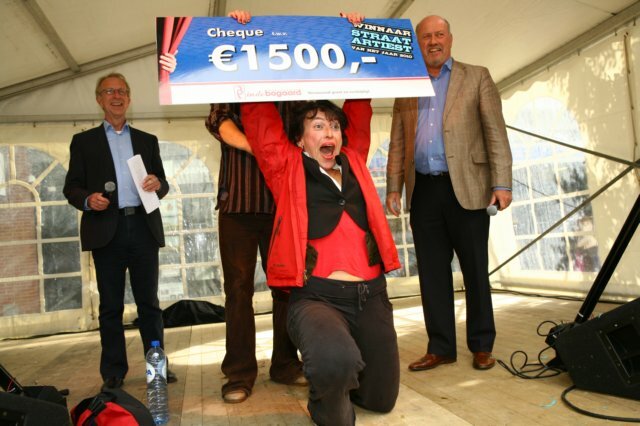 And this was not enough, Miss Minetti closed her season by winning the Streetartist of the Year Award in Holland by being the most entertaining show!!! Get an impression of my show. Next show will be in Doesburg Binnenste Buiten on the 16th and 17th of juli! The website is put online by Marc de Ruijter and Yvonne Zegers from dizid.com.